Holy road tar Batman I married Super Woman! It seems like just a few months ago I was teaching Diana how to ride a motorcycle in a school parking lot in Baltimore. Turns out that was 5 years ago. She has been a dedicated student of motorcycling ever since. She soaks up knowledge like a sponge… as long as it doesn’t come from her husband. Most say that she rides better than me. I say she rides better than most. On top of that she does an excellent job of navigating, mapping and creating great rides. When asked why we should ride through two hours of rain to get to a bike rally she responds with “because that’s what we do!”. 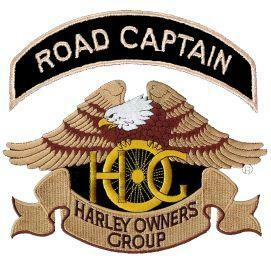 So I guess it is only natural that she was patched tonight as an offical HOG Road Captain in First State Chapter. Congratulations Princess, I’ll follow you anywhere!